Tickets: This is a free event. All Welcome! Eva Clarke will tell her story of survival and why it means so much to her to tell her family’s story and to be involved in Holocaust Education. In December 1941, Eva’s parents were ‘Torn from Home’ and deported to the ghetto of Theresienstadt from Prague where her parents, Anka and Bernd had met and married. Her father was murdered at Auschwitz but her mother survived, probably because she was still strong enough to work and was sent to a slave armaments factory in Germany where she spent 6 harrowing months, becoming more and more starved whilst more and more obviously pregnant; she weighed just 5 stone when she was about to give birth at 9 months. Eva is a survivor of the Holocaust, but only just, born on the steps of the Mauthausen Concentration Camp in Austria which her mother was transported to just in time to give birth there, thankfully days before liberation. After the end of the war, Anka and Eva were almost the only survivors from a large family. Today, having emigrated to the UK as a child with her mother and stepfather, Eva Clarke has been married for 51 years and happily living in Cambridge ever since, with an extended family again of children and grandchildren. 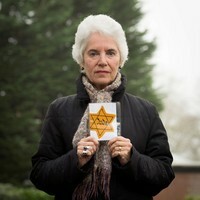 Eva travels all around the country and beyond on behalf of the Holocaust Education Trust, and she is involved in the Historyworks programme for Holocaust Education in Cambridge, giving inspirational talks to young people in Cambridge Schools and Colleges. Tonight, all are welcome to come along to Eva Clarke’s illustrated talk and have an opportunity to listen and ask questions. You don’t need to be a member of the Faiths partnership who are hosting the event to attend, because it is open to those of all faiths and those of no faith too. All are welcome!